Over the period of about seven years, the national domain of a small Balkan country has claimed nearly one million registered domain names and has become a valuable player on the secondary market. The profits from .ME domain registrations go to the development of the Internet infrastructure of Montenegro. Thanks to the dynamic marketing politics, the .ME domain has gained popularity as GccTLD (generic country code top level domain), which refers to a country code domain functioning as generic. The attractiveness of the .ME domain stems from its meaning in English. It can be successfully utilised in creating memorable domain names, such as those used by some big brands like for example Facebook (FB.me) or WordPress (WP.me) as well as several Fortune 500 companies. The .ME domain is doing well on the secondary market as well and ranks number ten in terms of the total sales under .ME made public ($ 6,8 million) –placing between .TV and .FR. 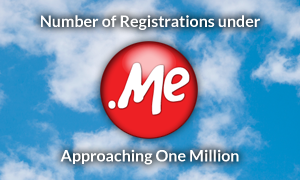 The average value of .ME domain, given more than five thousand transactions in all, is $1,353.